There was a time when hybrid drivetrains were only used in ultra-green cars like the venerable Toyota Prius. In recent years however, even automakers like Ferrari have embraced the concept of hybrid drivetrains in an attempt to build cars that satisfy ever-tougher emissions and gas-mileage regulations without sacrificing performance. Last week, Ferrari’s latest two-motor hybrid patents were revealed online. Now the automaker has officially unveiled its V12 HY-KERS system to the world at the 2012 Beijing Auto Show, which it hopes will power the 2013 successor to the Enzo. Based on a modified Ferrari mid-rear engine layout, the HY-KERS system combines a 12-cylinder engine and dual-clutch gearbox with two electric motors. Utilizing Kinetic Energy Recovery System (KERS) technology from its Formula 1 race cars, the new HY-KERS system can capture energy from braking, storing it the car’s battery pack until it is needed under acceleration. Thanks to its dual-clutch system, the HY-KERS system should enable its cars to provide a more constant acceleration, reducing the jerk associated with traditional gear-changes. 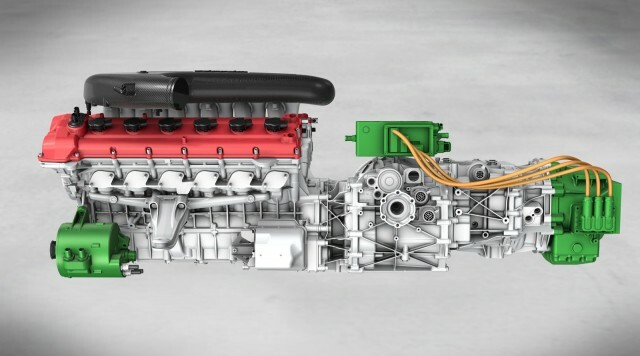 Lighter than previous generation hybrid drivetrains, Ferrari claims the new HY-KERS system adds approximately 1 kilowatt of additional power for every additional 2.2 pounds weight the hybrid drivetrain adds. Ferrari hasn’t detailed how heavy the entire system is, but has implied that the resulting power-to-weight ratio of any car it is fitted to should remain impressive. In fact, Ferrari is promising a 0-60 time of under three seconds, and a combined gasoline + electric power output totaling more than 900 horsepower. Once complete, the system should help reduce emissions by up to 40 percent over combined cycle tests. Given Ferrari’s recently announced 2012 F12 Berlinetta produces 350 grams of carbon dioxide per kilometer travelled, it has a long way to go before it achieves true green car status. With any Luck, we’ll see the latest HY-KERS system used in Ferrari's planned Enzo replacement, due to go on sale by early 2013.